Savvy brides already know how just cute, and not to mention how informative those wedding blog sites are-Adorable sites like Style Me Pretty, The Knotty Bride, and Green Wedding Shoes. And how about those amazing photo shoots you see on them of those lovely engaged couples- the gorgeous girl with a new sparkly diamond on her finger, her hair and makeup styled just so, with love just radiating from her eyes? ..Who are they? ?...All photographed oh-so-beautifully in ethereal dream-like settings and venues...where is that??? ..and now you are checking them out and sighing to yourself...ahhh. I want to do that!! Well, my lovely newly betrothed, you can. 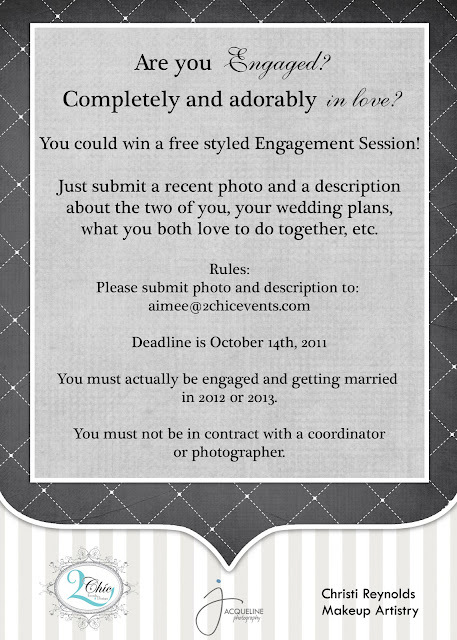 If you are are engaged, and are getting married in Northern California in 2012 or 2013, you can enter to win one of these deliciously sought-after photo shoots, and possibly see your gorgeous engaged self on a wedding blog site. I am teaming up with Aimee Wendell from 2Chic Events and Design, and Jackie of Jacqueline Photography to offer a chance to win a styled shoot that we plan to submit to be featured.